Shirts With Random Triangles: Mississippi St. Head Coach Dan Mullen Defends New NCAA Satellite Camp Ban. Mullen defended the move sought by the SEC, which already had a similar in conference ban in an interview with The Jackson Clarion-Ledger. Mullen cited concerns with the level of compliance at satellite camps as one of the reasons for supporting the ban, comparing it to the level of compliance on-campus. “Are they flying their whole compliance office to these camps, making sure things are done right?” Mullen said. “ All that. Our compliance guys are at practice here. And budgetary, (the NCAA's decision) made sense to me." 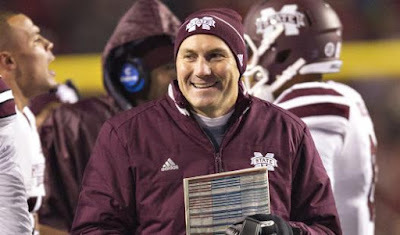 Mullen also stated his belief that prospects benefit more from "the experience of being on a college campus" then they would at a satellite camp.